He breaks slave chains in an ivy league classroom and playacts the murder of Christ. In a carpeted living room, he rubs mud all over his face and tells the story of Muddy Duddy. At a wedding underneath an old beech tree, he dances in his bare feet and kisses the ground. Once a month he stands naked before a microphone, broadcasting a radio program from his apartment via satellite to Japan. I ask Dr. Hugh Morgan Hill, a.k.a. Brother Blue, why he does it. He tells me, “Everywhere I turn, I see those eyes, those eyes. Everybody’s a runaway. It could be you.” I ask him for rough dates. He looks past me and says, “I was in Shakeapeare’s band. I shook his mighty spear for him.” His anchor, manager, and devoted wife, Ruth Hill (coordinator of oral history at Radcliffe’s Schlesinger Library), suggests he take at least one bite of his sandwich before beginning a seventy-two-hour storytelling marathon. Brother Blue is to storytelling what John Coltrane is to jazz. Both start with a theme, then work it from the inside, choosing from a polyphony of tangents that leap over so many synapses in the brain — guttural rumblings, rapid-fire phrases, parenthetical asides, and unexpected hollers — then back down to the lyrical ground and out out out. Like Coltrane, Blue plays his instrument (which is his entire body) as though he and the whole broken world depended on it for deliverance. Walking down Story Street in Cambridge, Massachusetts, people of all ages, sizes, and shades light up when they see this multihued contemporary griot covered in butterflies, bells, balloons, ribbons, and a banner announcing, BROTHER BLUE: STORYTELLER. Underneath the trappings of this roaming town crier and his allegorical tales of the triumphant underdog, is a man fueled by a faith in the transformative power of sacred service. With stacks of degrees to his credit from universities such as Harvard and Yale, Brother Blue, the official storyteller for the City of Boston and the United Nations Habitat Forum, is heralded as “the father of modern storytelling,” as well as a pioneering educator, radio artist, and theologian. 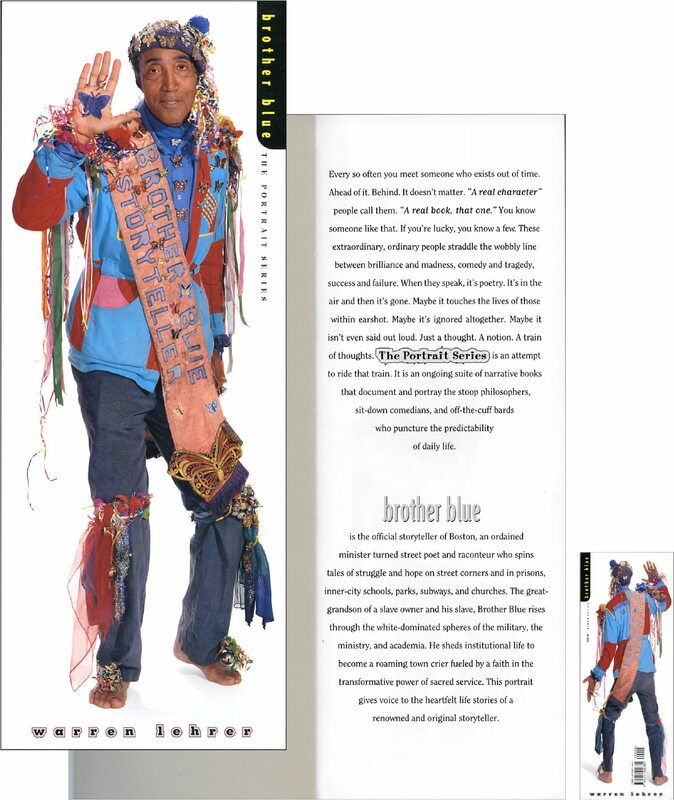 Although Brother Blue continues to preside over congregations, lecture halls, nightclubs, and theaters, he devotes most of his unrelenting energy towards the public domain of street corners, parks, subways, prisons, hospitals, inner-city classrooms, and storytelling workshops. The great-grandson of a slave owner and his slave, Brother Blue rose within the white-dominated spheres of the military, the ministry, and academia, and then emerged as one of the original Afro-American hipster rappers from the street. This portrait sheds light on a unique life and vision by giving voice to the stories behind the stories the storyteller tells. 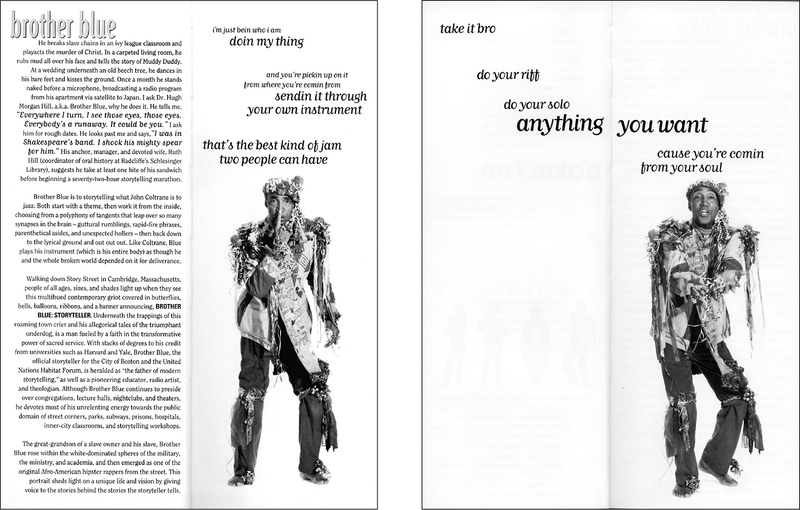 “[Warren Lehrer’s] most recent effort is The Portrait Series, published by Bay Press, Inc. 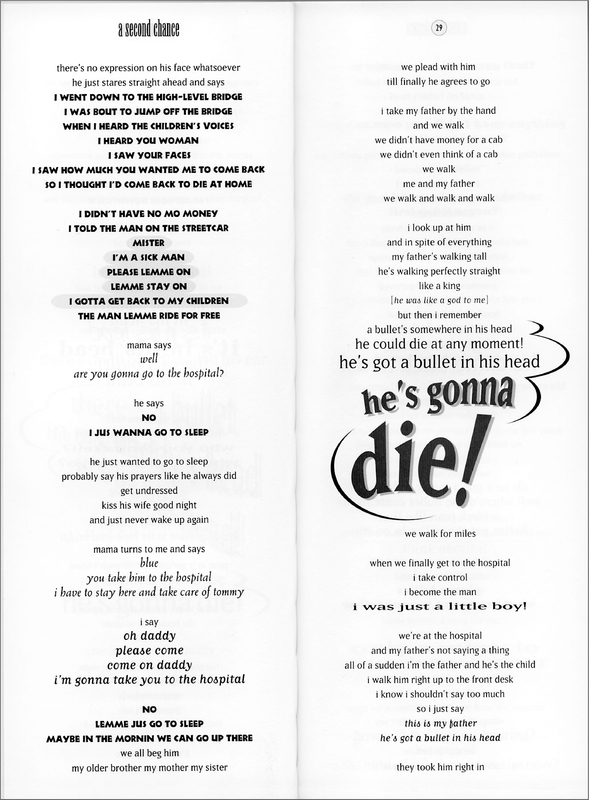 The series consists of four books, each a profile of a man, written by Mr. Lehrer, but presented as an autobiographical, first-person monologue. (Mr. Lehrer is at work on a series of portraits of women.) 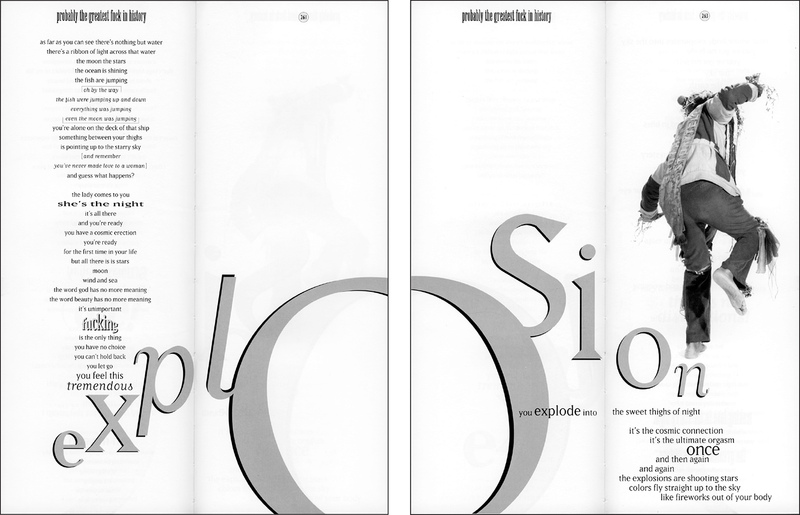 Each book is composed using an idiosyncratic synthesis of storytelling, poetry, typographic design, illustrations, and photographs. Influenced by Dadaism, futurism, and the writing of e.e. 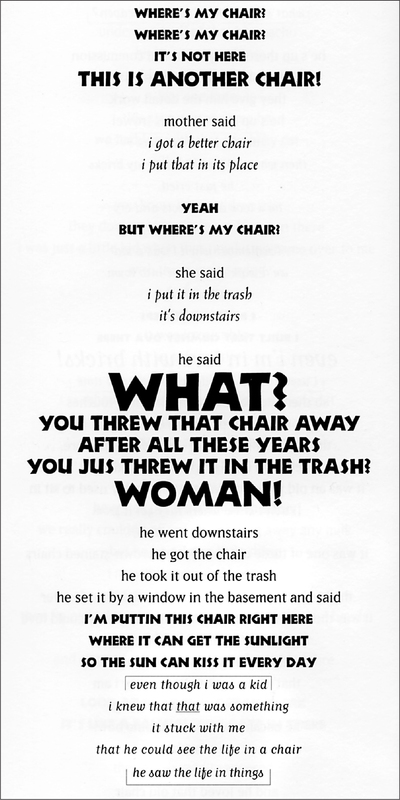 cummings, Gertrude Stein, and the American poet and painter Kenneth Patchen, Mr. Lehrer’s books explore the plasticity, the physicality of words and groups of words—words that dart and swoop and blare and recede and curl up and pop out and undulate and zoom across the page. 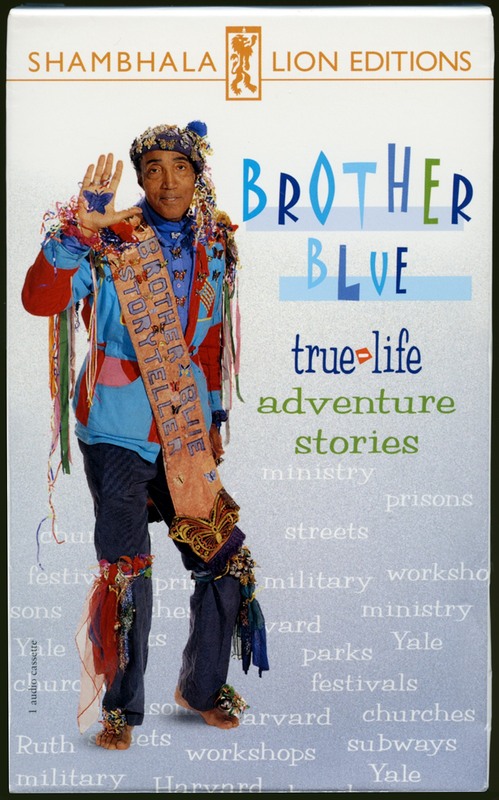 Sadly, Brother Blue died in 2009, at 88 years old. He lived a very full, very rich life, and touched legions of people with his extraordinary gifts as a storyteller and person who felt deeply about all sentient beings. After the book came out, Brother Blue and Warren Lehrer did some reading events together. Warren read selections from the other three books in the Series, and Blue told stories from his life. 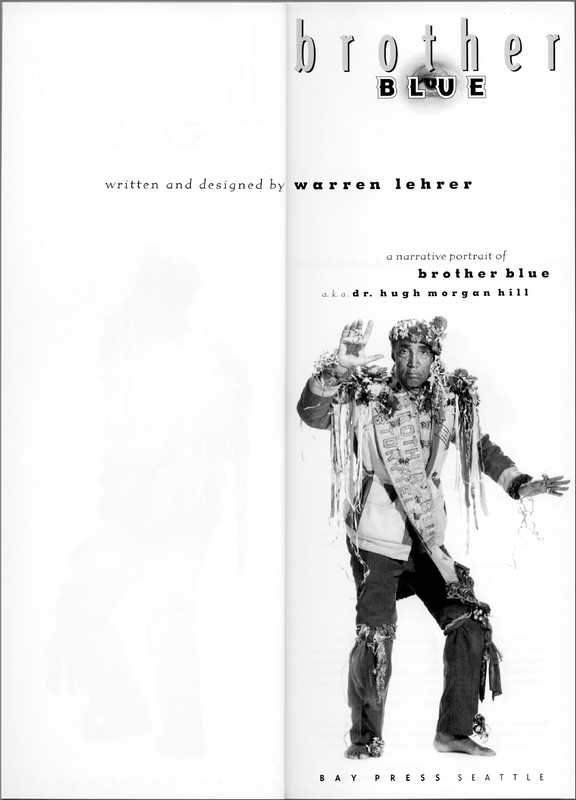 In 1998, Shambhala Lion Editions produced an audio book of Brother Blue reading excerpts from Lehrer’s Brother Blue portrait book. 6.5” x 9.75” x 267 pages. Paperback. Four color cover. One interior (black). This expressionist portrait gives voice to the stories behind the stories of Dr. Hugh Morgan Hill, a.k.a. 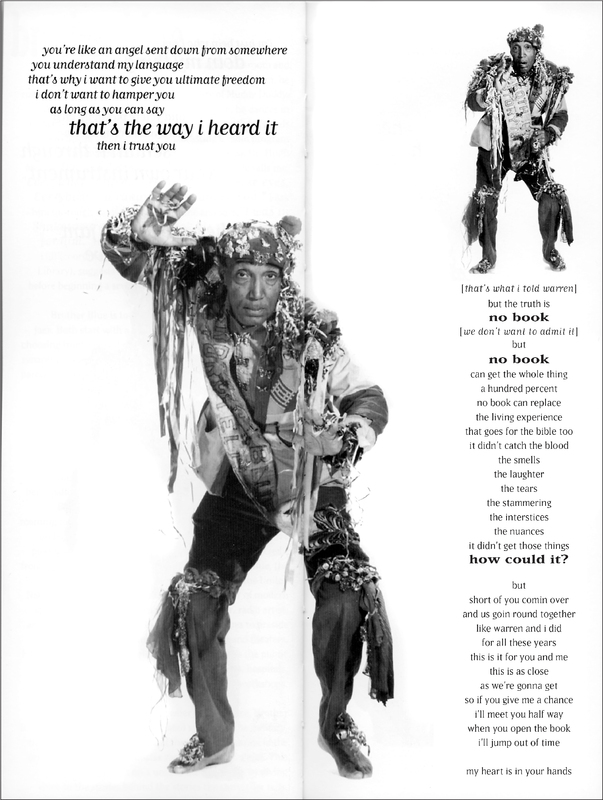 Brother Blue, the official storyteller of Boston and Cambridge, Massachusetts. The great grandson of a slave owner and his slave, Blue rises through the white dominated spheres of the military, the ministry and academia, then sheds institutional life to become a roaming town crier, street poet and raconteur — fueled by a transformative power of sacred service. Renowned for spinning parables of struggle and hope on street corners and in prisons, schools, subways, and churches — Brother Blue entrusted me with writing this portrait based on his seldom heard accounts of growing up during the depression under the spell of mythically heroic parents; serving as a black lieutenant during World War II in the segregated US Army; and riotous attempts at turning the hallowed traditions of the Ivy League and the church on its head! 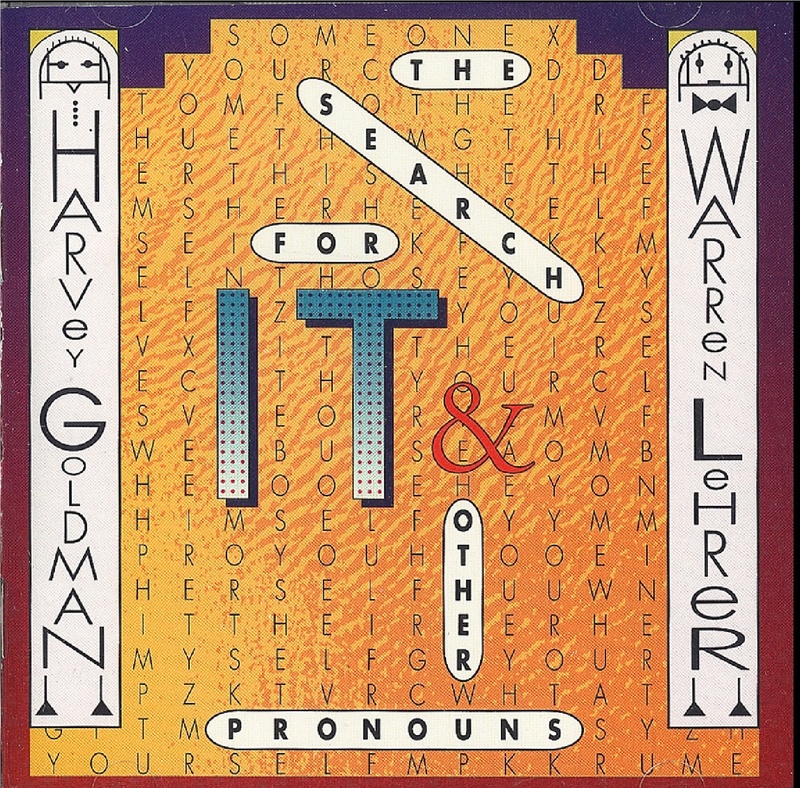 The cut “You and Me” on Harvey Goldman and Warren Lehrer’s 1991 New Music CD The Search for IT and Other Pronouns features the powerful voice of Brother Blue. 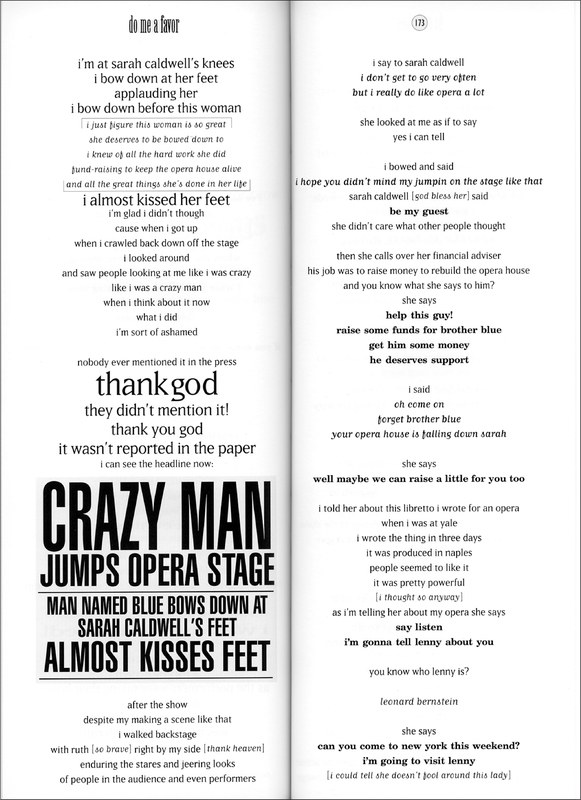 The text of You and Me is culled from several pieces in the book.